Castor is an importanat oilseeds crop. 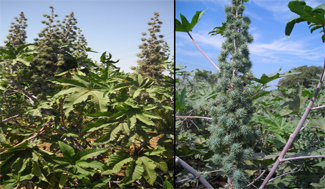 Castor finds a palce of presting in the cropping systems of dry-land agriculture in semi-arid zones of India, because of its deep root system, drought tolerance. and quick growth. India contributes over 60% of the entire global producation. Castor plays an important role in the agricultural economy of the earning substantial foreign exchange through export of castor beens and oil. India is the firsdt country in world to export heterosis in this crop on commerical scale. Castor oil finds a numbers of uses for domestic, medicinal and industrial purposes. It is useds as a lubricant, an illuminant, in polishes ointments, waxes printing inks, cosmetic, hair dressings, soaps and dis-infectants. Vibha seeds have initiated castor breeding programme at gandhingar, Gujarat looking in to its economic importance.